We are located at the end of Lora Lane. Lora Lane is off of School Rd. 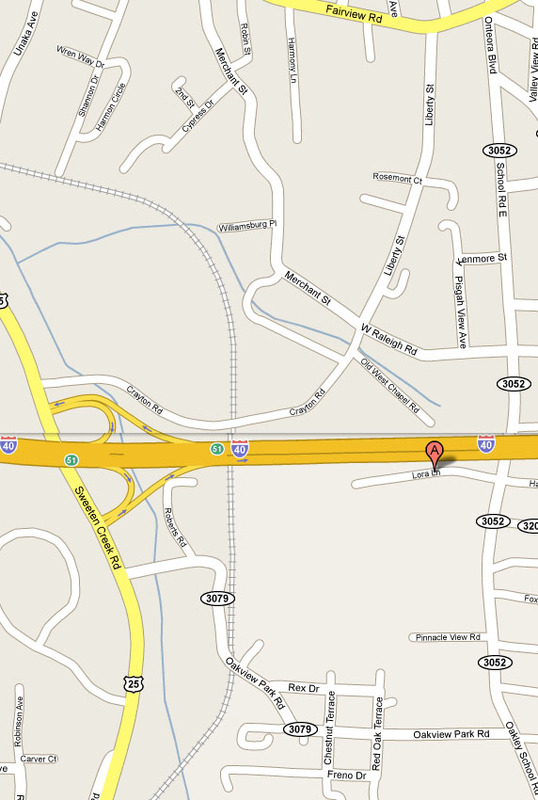 School Rd is off of Fairview Rd which is exit 8 on I-240. At the point where you turn off Fairview the sign says "Onteora Blvd." but it becomes School Rd after one block. Lora Ln is also accessible from Sweeten Creek Rd (Hwy 25A). One block south of I-40 turn up Roberts Rd. This becomes Oakview Park after a short distance. Turn left on School Rd when Oakview Park comes to an end. Turn left again on Lora Lane and go to the end.